Super Bowl LI, Pepsi and Intel, and the New England Patriots and Atlanta Falcons, all put together a dazzling Super Bowl LI evening for NFL fans. Between the most epic comeback win in big game history and the innovative Pepsi Zero Sugar Halftime show featuring mega entertainer Lady Gaga and dancing Intel drones, it was pure awesomeness. NRG Stadium hosted the 2017 SB 51 to the delight of football fans worldwide as well as countless music fans. A massive U.S. audience of around 111.3 million people watched the Fox broadcast according to Nielsen ratings, with another 650,000 on Fox Deportes and an additional streaming average of 1.7 million on internet browser enabled devices. The actual viewership numbers are higher because those watching in sports bars and together on big screens are not counted. The Sports Techie community blog toasts the world’s most popular single sporting event with a virtual cheer for a job well done. Pepsi also rolled out additional activations during the week including, a guest of honor, behind the scenes fan experience at the halftime show, the NFL Rookie of the Year award won by Dak Prescott, and the LIFEWTR “Art After Dark” Experience. Each generation of fan was successfully targeted by Pepsi making it a win for everyone. To get the festivities started, a 10 second countdown before Gaga’s inspiring Pepsi halftime show performance featured a pre-recorded lead-in of legendary singer Tony Bennett designed to warm up the crowd. PepsiCo’s innovative Creators League Studio produced the intro lead-in. Gaga began with a rendition of “God Bless America’ followed by a sequence of her most popular hit songs, ‘Bad Romance,’ ‘Poker Face,’ ‘Born This Way’ and new hit ‘Million Reasons,’ aimed to augment the singing, dancing and football related experiences. The physical performances during the 13 minute show were fun to behold. The dancers, the crowd participation and the many technical aspects of the SB 51 halftime will forever live in infamy. Halftime Powered by Pepsi Zero Sugar and Intel Drones. 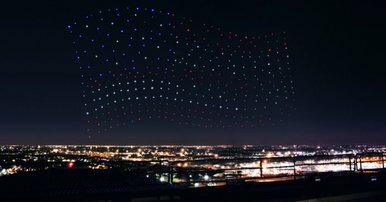 In a sign of the future is now, Intel and Pepsi collaborated on a first of its kind integration drone light show during a televised event and a Super Bowl at the beginning of the show. The ‘Shooting Star’ unmanned aerial vehicles airborne simultaneously show of 300 dancing drones was taped earlier in the week to ensure no FAA or Super Bowl security regulations were triggered. The drones assembled in formation as an American flag as well as the Pepsi logo. Each drone has special LED lighting capable of producing four billion different color combinations. Intel used a central computer to orchestrate the UAV quadcopter performers. Hats off to the Intel engineering team for writing the sophisticated codes, algorithms and flight programming specs needed for the drone dance party system to be a success. PepsiCo had a series of activations and events leading up to Super Bowl LI. Guest of Honor/Behind the Scenes at the Halftime Show: Giving fans the ultimate opportunity to win an once-in-a-lifetime Super Bowl experience, Pepsi, Lady Gaga and the NFL launched the “Guest of Honor” program, which offered fans a chance stand stage-side at the Pepsi Zero Sugar Super Bowl Halftime Show. One notable fan who won was 90-year-old Grandma Gaga. 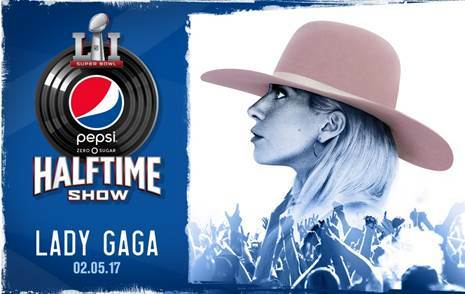 In the weeks leading up to Super Bowl LI, fans were also able to visit www.pepsihalftime.com to see exclusive behind the scenes videos of Gaga preparing for her epic show. 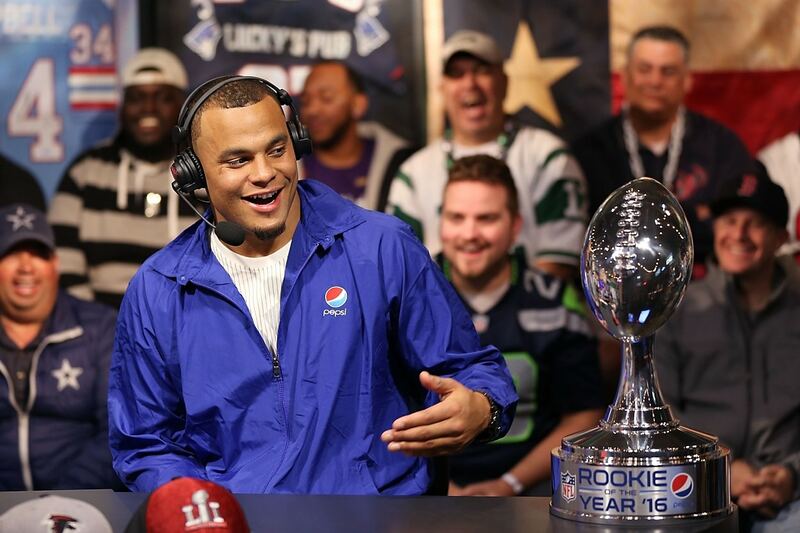 Dak Prescott named Pepsi Rookie of the Year: Dallas Cowboys quarterback Dak Prescott won the 2016 Pepsi Rookie of the Year award, winning the fan vote that took place on NFL.com over fellow finalists Ezekiel Elliott, Joey Bosa, Deion Jones and Carson Wentz. LIFEWTR “Art After Dark” Experience: LIFEWTR, a new premium bottled water that fuses creativity and design to serve as a source of inspiration – as well as hydration – partnered with the ultimate traveling night club, Club Nomadic, to host “Art After Dark” – an entertainment experience fusing music, technology and art last Friday, Feb. 3. Global superstar and multiple-award-winner Bruno Mars headlined the event with a special performance by DJ Khaled. Tickets sold out in less than one minute, making Art After Dark one of the most coveted experiences in Houston. In honor of 1893™ from the makers of Pepsi-Cola®, an exclusive speakeasy-style lounge offered 1893 and bourbon cocktails, transporting attendees to an elevated time. Visit this link for more information on Art After Dark. 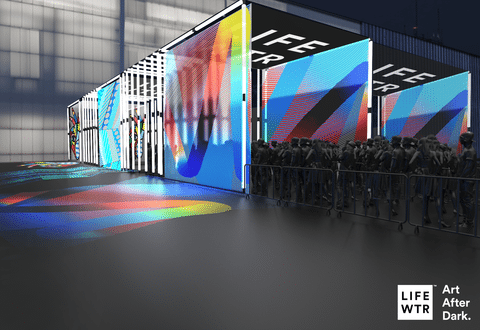 LIFEWTR “Art After Dark” Fan Experience at Super Bowl LI. LIFEWTR, PepsiCo’s premium bottled water featuring captivating label designs by emerging artists, partnered with the ultimate traveling night club, Club Nomadic, for Super Bowl 2017. This is a rendering of the event space, featuring the LIFEWTR label designs. Pepsi For The Fans NFL Pylon Cam Giveaway. Sports Techie, the Super Bowl is an American jewel. Sports tech continues to morph the global event to unprecedented levels. This season, the NFL, Pepsi and Intel together set new Super Bowl standards and were a major influencer for generations to come. Implementing dancing drones powered by Intel was simply cool. Lady Gaga was an excellent choice as the the halftime show performer. I loved the video clip on Fox Sports showing Michael Strahan’s twin daughters getting to meet Gaga in person. It humanized Gaga yet showed her impact on the lives of countless youth and adults alike through her music. 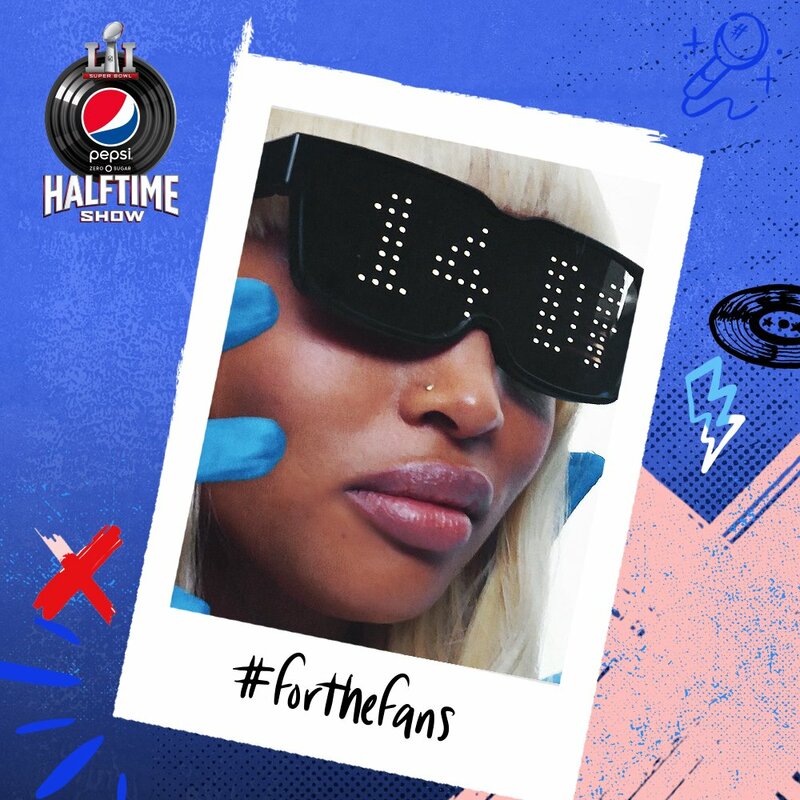 Pepsi’s use of social media hashtags such as #PepsiHalfTime, #forthefans and #ExperienceMore helped to improve fan engagement. 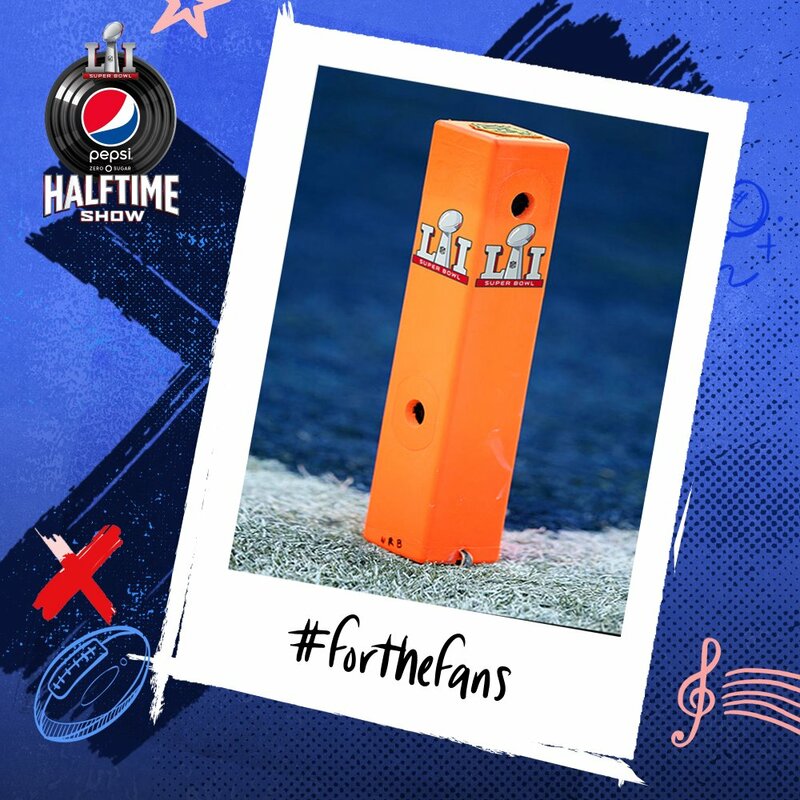 Giving away a free NFL Pylon Cam for the Pepsi For The Fans Sweepstakes was genius. For you fantasy football players, I had goat Tom Brady on my fantasy team this year. Down the stretch he was amazing as usual this season except for the game in Denver against the Broncos when he laid a fantasy football egg for my Sports Techie team in our league’s semifinals that I lost. Brady bounced back nicely the following week against the NY Jets in our third place game just like he did in the second half last night. Today marks the seventh year of blogging for the Sports Techie community blog according to LinkedIn. Thank you to everyone for all the support along the way. I have been going through a sea of change in regards to my family, career and life in general the past several months. I am the new Director of Business Development for ScoreMore, LLC and have been working hard at this job to take business to the next level. Curating the Sports Techie community across our social media handles continues to be as uplifting for me as ever. I want my son Kellan to know that he inspires me the most of all things and not seeing him the past two months now and counting has been hard on us both, feelings he cannot tell others since he is currently nonverbal because of autism. 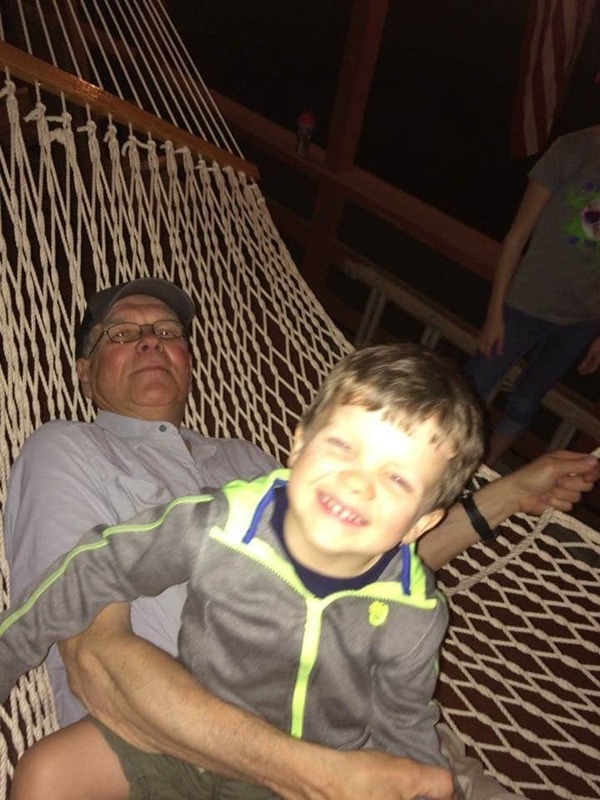 I will be with you again as soon as child custody details are worked out mi hijo. I love you. THE Sports Techie inspiration, Kellan Roble. I also want to give my immense gratitude to the people and companies that share these amazing sports technology driven stories for me me to share with our followers and readers all over the world. I miss you Seattle but Atlanta is my new home. I am truly thankful to be the THE Sports Techie, it has been a character development opportunity and ongoing lifetime journey that will continue as long as I can make it so. Blessing to you all and to Lady Gaga for deliver a Super Bowl halftime show worthy of the ages thanks to Pepsi, Intel and the NFL.